Gelatin is a nutritionally rich and complete form of collagen that helps restore and invigorate healthy skin, hair, teeth, nails, joints, digestion and hormonal balance. While gelatin provides the same benefits as collagen hydrolysate, it skips the molecule-reducing hydrolysis process, resulting in a powder that gels when added to food and drink. 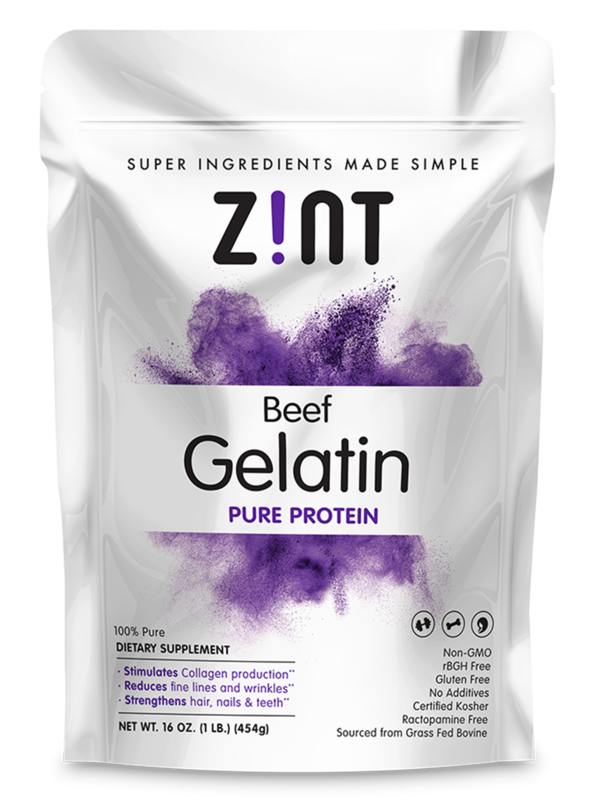 Zint Gelatin is derived from 100% pure, non-GMO, kosher-certified, grass-fed bovine hides. The natural raw materials are purified and extracted in a way that preserves its vital amino acid profiles, including arginine, glutamine, glycine and proline. Completely neutral in flavor, our gelatin powder dissolves only in warm or hot water and forms a gel. Supercharge your anti- aging supplement regime by adding it to recipes that require thickening, such as jello, homemade marshmallows, gummies, pancakes, cookies and fruit snacks. Collagen comprises 30% of our bodies’ total protein. Found in our skin, bone, tendons, ligaments, muscles and cartilage, it’s the main component of all our connective tissue, giving our skin its elasticity and literally helping to hold the body together. By our mid-20s, however, collagen production in our bodies is already in decline, and it decreases further as we continue to age. The result is an acceleration of age-related markers such as wrinkles, sagging skin, painful joints, osteoporosis, inflammation, and weak hair and teeth. Zint Gelatin helps to reverse that decline. By providing key amino acids that trigger the body to produce more collagen, it assists in building muscle, protecting joints, increasing energy and supporting weight management. It’s also a boon to beauty, with improved skin moisture levels, renewed skin smoothness and suppleness, reduction of micro-relief furrows and prevention of deep wrinkles. 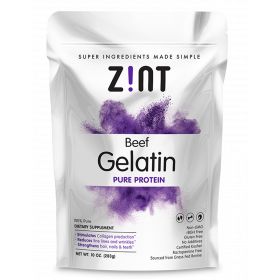 Is Zint Gelatin collagen type 1, 2 or 3? Zint Gelatin is comprised of both type 1 and 3. Type-1 collagen is the most prominent matrix of protein in the skin and is responsible for making skin firm. Type-3 collagen is found in human tissue, giving skin its plumpness and soft texture. As we age, the stronger type-1 collagen gradually replaces type-3 collagen, and the skin begins to lose it youthful properties. 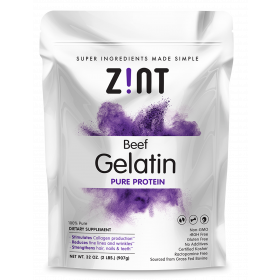 How much Zint Gelatin should I consume daily? 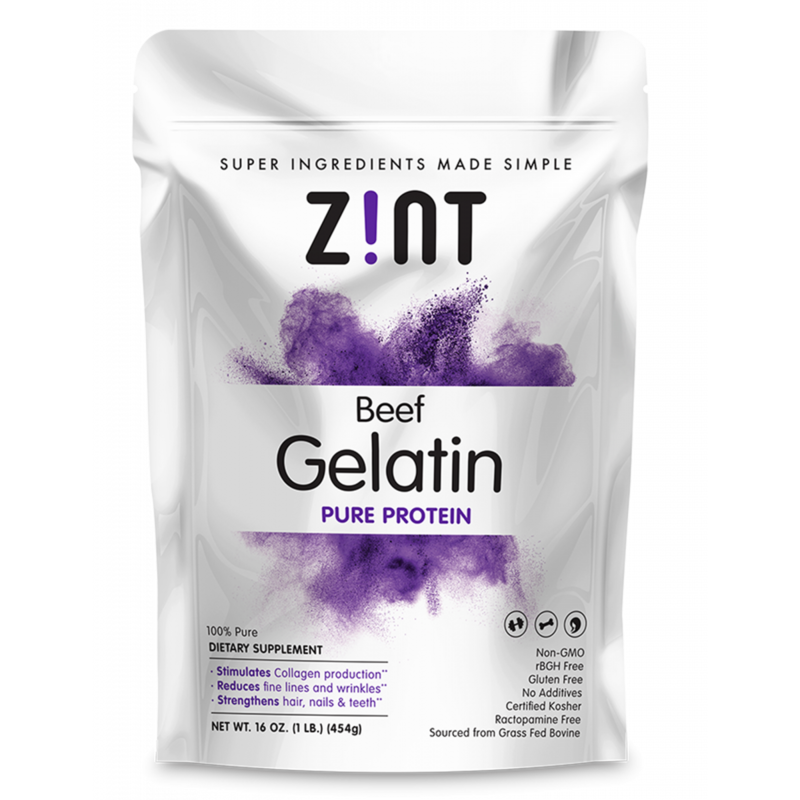 In order to experience the maximum benefit of Zint Gelatin, you should ideally consume two tablespoons per day in two separate doses: one in the morning and one in the evening. What’s the difference between gelatin and collagen hydrolysate? Regular gelatin is recognized for its ability to “bloom” or thicken. When mixed with a liquid, it takes on a thermo-reversible gel-like consistency at room temperature and can be dissolved by adding hot water. Collagen hydrolysate is purified through a process that breaks it down into smaller molecules, thereby reducing its ability to gel. Unlike gelatin, which only dissolves in hot water, collagen hydrolysate will dissolve in cold water and is more easily digestible. seems to work for my joints and hair. quick dissolution in my hot coffee or hot cereal. Great product, love that I found a All-natural, non-GMO, grass-fed, pasture-raised cattle hides, no preservatives, certified kosher, gluten-free, ractopamine-free, rBGH-free produc I love the fact that I live the Bulletproof diet, and these type of products are available. Thanks. I bought this product for two purposes: to make gummy bear and to make peel off mask. I haven't get a chance to make gummy bears yet, but I did make some peel off facial mask with this gelatin. The result was quite all right, even thou I prefer peel off mask made from fish gelatin. This gelatin has this "less pleasant" smell, while the fish gelatin almost has no odor. This gelatin also less strength compared to the fish gelatin, so it would be my least favourite peel off facial mask. Perhaps, this gelatin would be awesome for gummy bears. I am excited to try. As for the price, I think it's pretty fair, and I am glad that this product is free of Preservatives, Gluten, and non GMO, where the animals were Pasture-Raised on strictly organic diet.